Meriam Yehya Ibrahim, 27, gave birth to a baby girl in a Khartoum prison last month, two weeks after she was sentenced to 100 lashes and to die by hanging. Her husband is a U.S. citizen, and her two children, including the newborn, live with her in prison. A Sudanese lawyer has filed an appeal to reverse the verdict by a lower court. 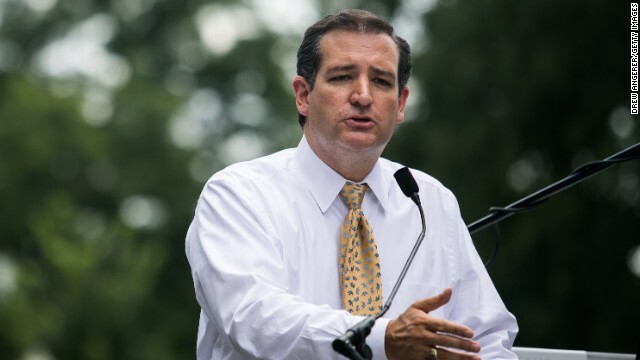 Cruz, a potential presidential candidate who's known for speaking out for Christians imprisoned in other countries, made his remarks Thursday at a social conservative gathering hosted by the Faith and Freedom Coalition in Washington. Obama's national security council spokesperson Caitlin Hayden issued a statement last month when Ibrahim was sentenced. "We strongly condemn this sentence and urge the Government of Sudan to meet its obligations under international human rights law," she said. Cruz joined a demonstration outside the White House last week to raise awareness about Ibrahim. He did the same in 2013 for Saeed Abedini, a Christian pastor who's serving time in Iran for sharing his faith. Obama spoke publicly about Abedini at a national prayer breakfast earlier this year. Please shut up! Nobody is listening and the only one who needs to be sent home is rafaelito himself. Really? This idiocy from a member of a party that treats women like breeding cattle? The GOP is crazy! i guess your mother must have been a republican as you are here ranting about women just like her. otherwise you would be residing in a landfill right now. "Isn't it funny that now that a suspect in the Benghazi attack has been captured there is absolutely nothing about Plan (B)enghazi on the Ticker. (Btw, thanks Sniffitt) However, when the GOP was howling at the moon claiming the POTUS and Hillary were responsible, there were multiple articles daily??? Does anyone else find that ironic? ?😳😳😳😳"
Not me... it is par for the course. In case anyone has forgotten, we had heated discussions regarding the 'failure of the ACA' becuase of the minor glitches in the website. righties immediately announced complete and utter failure and called for Obama to be impeached (for that... Haahahaahahahaa- rubes), but now look.... not a GD word about it and the media hs abandoned talking about it because it is a success. It is working and working well. (more like wrong-- on every single issue! ).